Astonishing figures that show the true scale of our online activity have been revealed. The new study, by chipmaker Intel, found that more than 204 million emails are sent every minute, while 47,000 apps are downloaded and retail giant Amazon rings up around £55,000 ($83,000) in sales. Around 20 million photos and 6 million Facebook pages are viewed, while we also watch 1.3 million video clips on YouTube. 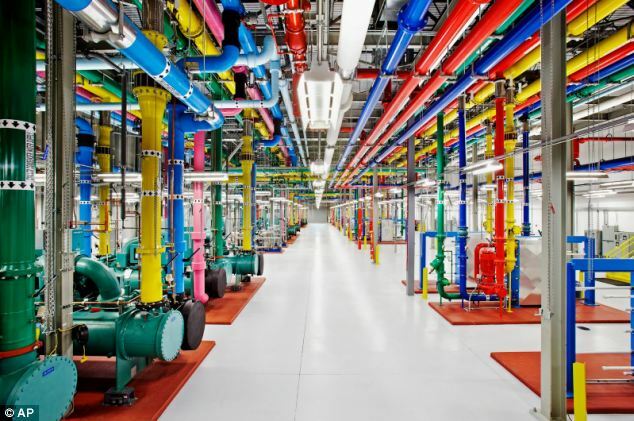 Nearly 640,00 Gb of global IP data is transferred in just one Internet minute, the researchers found. 'Computing is transforming and touching more people in a wider range of devices,' said Intel's Krystal Temple. 'But while it’s hard to miss the proliferation of portable devices, it’s what we don’t see that’s the bigger issue. 'What many don’t see is that the increase in mobile devices has had a tremendous impact on the amount of data traffic crossing the network. 'It’s a little easier to comprehend once we think about all that’s done on a connected device like a smartphone. The study also looked at how the data could expand dramatically in the future. It predicted that by 2015, the number of networked devices is expected to be double the world’s population. 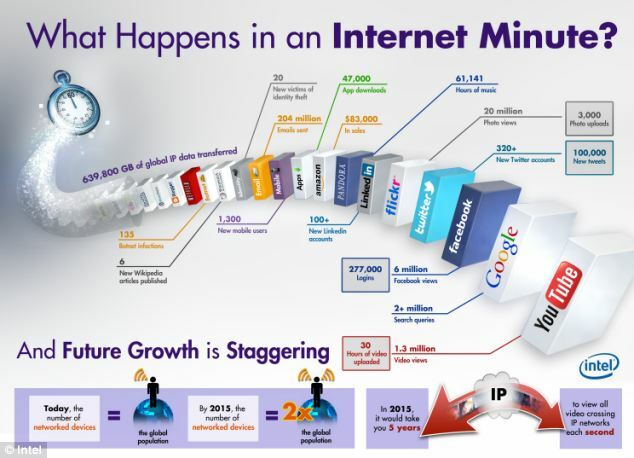 It would take five years to view all the video content crossing IP networks each second by then. The chip giant also revealed it is developing new networking equipment to deal with the increase in traffic. Codenamed 'Crystal Forest,' that will boost performance and beef up network security to handle the increasing network traffic. 'By enabling equipment manufacturers and services providers to deliver platforms that grow along with the network, Intel is also enabling consumers to stay connected on intelligent devices every Internet minute of the day,' Intel said.